Addis Fine Art is pleased to announce, From Our Perspective: Young Ethiopian Photographers Changing the Gaze, a duel exhibition by dynamic young photographers Girma Berta and Eyerusalem Jiregna at Addis Fine Art Gallery in Addis Ababa, from 9 April - 25 May 2019. Ethiopia is home to some of the fastest rates of development in the world and a changing political landscape. Two young local artists, Girma Berta (b. 1990) and Eyerusalem Jirenga (b. 1993) aim to tell its story through their photography. They represent the new voices in contemporary Ethiopian photography, pushing the boundaries of the medium and questioning the definitions of documentary photography. Their works have been exhibited internationally and selected to adorn Prime Minister Abiy Ahmed's new public and private offices. Girma Berta (b.1990) is an award-winning photographer whose work fuses street photography with fine art. In his Moving Shadows series, solitary figures are juxtaposed against vibrant backgrounds, creating truly unique artworks, which exemplify the contrasting colours and personalities on the streets of his hometown. 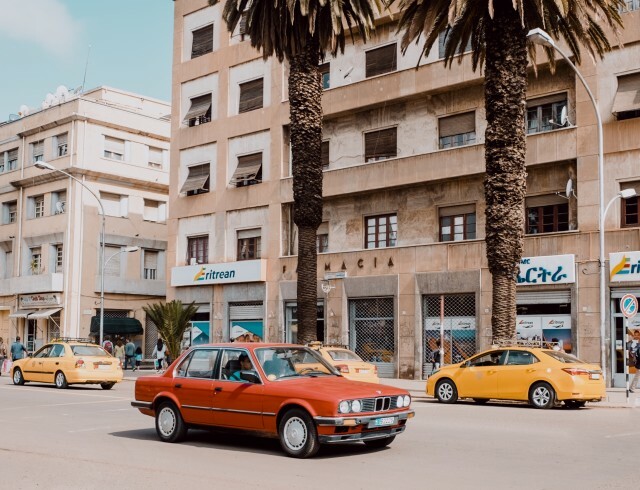 As one of the first photographers to travel to Eritrea once the blockage was lifted in June 2018, his new Asmara series documents Eritrea's capital frozen in time. Berta, who is self-taught, uses a combination of street photography and graphic design to create images of passers-by with a painterly quality. Berta's use of digital media, to produce and present his artworks, is in itself a commentary on the digital revolution underway across Africa. He represents the vibrancy of the millennial African. Eyerusalem Jirenga has received considerable acclaim for her work both within Ethiopia and internationally. She has exhibited in the New York photography festival Photoville 2016 and participated in the New York Times Portfolio Review 2016. Solo and Group shows include: FNB Joburg Art Fair (2018), Refraction: New Photography of Africa and its Diaspora, Steven Kasher Gallery, NY (2018), Investec Cape Town Art Fair (2018), Also Known As Africa Contemporary African Art Fair (2017). Girma Berta is the recipient of the Getty Images Instagram Award 2016. He was selected to participate in the New York Times Portfolio Review 2017, and shortlisted as a finalist for the CAP Prize 2017. Solo and Group shows include: Africa State of Mind curated by Ekow Eshun at The New Art Exchange, Nottingham, UK (2018), Refraction: New Photography of Africa and its Diaspora, Steven Kasher Gallery, New York (2018), Afrotopia: Pan-African Exhibition, 11th edition of Rencontres de Bamako, Biennale Africaine de la Photographie (2018), Image Afrique/Cap Prize in Basel (2017), La Gacilly Photo Festival (2017), Nataal / Red Hook Labs NY New African Photography II (2017). Berta's artworks have also been shown in multiple art fairs including: Cape Town Art Fair (2017 - 2018 - 2019), Art Dubai (2018), PhotoVille NY (2016, 2015), Look Festival (2016), Salon Zurcher NY (2016), 1:54 Contemporary Art Fair London (2016), Also Known as Africa Art Fair Paris (2016 - 2017) and Bamako Photo Fest (2015).